Patience + Persistence + Commitment = POWER! I've had many people tell me I'm a very patient person and, I guess, in some areas, I can be. For instance, where my son or someone else who has a cognitive disability is concerned, I am VERY patient. But, in some other areas, I would have to admit I'm not exactly the "Patience Poster Child". Like with weight loss, exercise, and living a healthy lifestyle. I want to be fit NOW, so that I can ride my bike or walk or even jog without being in pain. That's right, I push past uncomfortable (at least my definition of uncomfortable). Today, it was very windy and cold here and I walked outside. I walked over 3 miles and logged my fastest time yet. But, let me tell you, my lower back, hips, legs, and feet are in complete revolt now. By tomorrow, I'll feel better enough to do it again and the whole time I'll be asking myself, "When is this going to get easier?!" I also want to be thinner NOW. Last night, after a long bike ride, I snacked more at night than I should. My rationale? Why not? What does it matter? This whole thing is pointless because it's taking too long to get to where I need to be and I'll never make it. I should just give it up now. Because I need to relinquish my need for immediate gratification and cultivate healthy lifestyle patience. Patience can be built, just like you build a muscle. 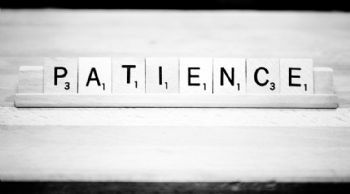 You use the patience muscle and build up reps, over time, and your patience will become stronger. What I need to understand and embrace (not just accept, EMBRACE) is that building healthy lifestyle patience is going to be hard, take practice, and time. Just like learning to play the piano. It will also require inner strength to keep going, face down my fear of failure, and trust myself. On the other hand, "IMpatience" might actually cause me to have MORE cravings (Think emotional eating). I have to remember that weight loss is NOT an instant gratification kind of thing -- a marathon not a sprint. I need to remind myself not to expect too much, too soon. Changes don't happen overnight. 1. I have to accept that this is the new me and my new lifestyle and EMBRACE THEM. This is NOT a diet. The prospect of being healthier – permanently – is something to be happy about -- a lifetime INVESTMENT in myself, just as important as any financial investment. 2. I need to take it a day at a time – just like AA. There is only here and now. At any given moment, the questions to ask myself are: "Is this in line with my Healthy Lifestyle goals?" and "Will this do something TO me or something FOR me?" These questions will help anchor me in the moment. 3. I can't put all my proverbial eggs in the scale basket. I have to form new, healthy habits like incorporating more grains into my diet, eating more veggies, and snacking less at night and focus on those behaviors. What the scale shows is only part of the picture and, depending on a number of factors, may not be as accurate as I think. Which is why expanding my healthy lifestyle horizons is important to decreasing my waistline. 4. I need to stay busy! Getting out and doing stuff is much better than sitting around ruminating about how hard it is to be “on a diet”. Reading a book or knitting is far more productive than putting unnecessary calories in my mouth while I'm watching t.v. 5. I need to believe in myself. This healthy lifestyle thing may be difficult, but it's not impossible. I've accomplished many things that most people would never try. There really isn't any reason that I can't be successful at this, too. My new Healthy Lifestyle Patience, combined with persistence and commitment will provide restraint when I am tempted, strength to get back up when I'm down, and hope when I am discouraged. Very well said. I like your action plan. Boy does this ring a bell! I too, have doubts about my ability to lose this weight and keep it off. I am constantly telling myself to stay in the moment and do the best I can. The pain is so discouraging but so is the thought of not being able to ride my bike or walk in the sun.